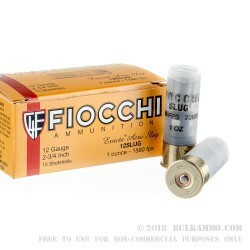 If you've been searching for a shotgun shell for medium and large game hunting, this 12ga Fiocchi ammo is for you! 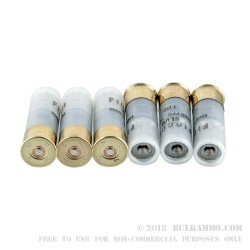 These 2-3/4 inch polymer shells contain a deadly 1-ounce rifled Aero slug that blasts out of your barrel at 1560 fps. They exhibit impressive accuracy when fired from both smooth and rifled barrel shotguns. 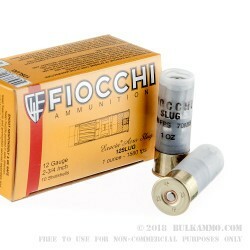 These Italian-made shotshells are the perfect companion to any hunting trip as the sheer power of the slug will cut through thick hide like butter and leave a devastating wound path. Slugs promote serious knockdown power because of the force with which they pound targets. These 12ga shotshells are powerful and pack a serious punch, but they also have a shoulder-pounding recoil, so this isn't ammo for the faint of heart. This 250-round case will give you enough 12ga ammo for a few hunting seasons! Order today!